The 5G is the mobile technology of the future. If currently the 4G allows speeds of up to 300 megabytes per second and has meant the era of connectivity, the 5G will multiply the speeds by almost 150 times, and will mean the acceleration of the internet of things. In a market that has not yet established who will pilot the new technology, Barcelona wants to be a benchmark: it will be postulated as the European 5G laboratory . 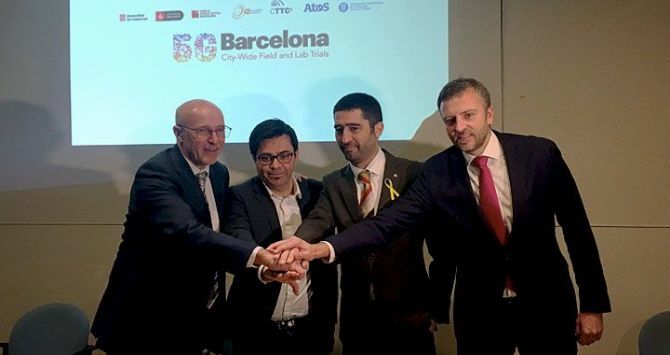 Generalitat , the City Council of Barcelona , the Mobile World Capital , the Foundation i2CAT , the CTTC , Atos and UPC have come together to achieve that goal through the 5GBarcelona initiative, which seeks to turn the city and Catalunya in one of the hubs of digital innovation in the field of 5G. The collaboration framework agreement will serve to present candidacy to the European Commission to be chosen as “5G City” and thus opt for European funds to deploy projects related to this technology, which is still under development. The joint EU plan (called 5G-PPP) has a budget of up to 700 million euros, and is divided into several phases. One of the next ones to be resolved is which cities will be chosen to obtain funds for projects. The Barcelona project, unlike other candidates that focus on specific issues, is much broader: create an experimental open environment of 5G city, that is, turn the city into a large laboratory where companies and administrations can test their solutions, explained Carlos Grau, director of the Mobile World Capital. In fact, it has already been discussed with Seat , FC Barcelona and Hospital Clínic to join this initiative. Technological rooms will also be used to publicize and promote projects, and the different telecommunications agents will join the initiative. The initial base of the project will be infrastructures currently under development in the city of Barcelona, ​​while agreements are sought with other actors for new investments. The Secretary of Telecommunications, of the Generalitat, Jordi Puigneró, defended that the agreement will serve to “create wealth”, while the director of technology and innovation of the i2CAT Foundation, Sergi Figuerola, said that Barcelona will compete with “10 or 12” consortiums in the European contest. In five years, the 5G will create an annual economic activity of 130,000 million euros and more than 2.3 million jobs. A market, according to Grau, to which Catalonia can obtain between up to 15% of resources.